This term is used to help understand what a given activity, workout, or even your accumulated training, is focused on. You first get exposed to the concept of Focus Duration when you choose your Athlete Types during the Xert account profile setup process. Athlete Types correspond to a particular point on your power curve represented by a duration. 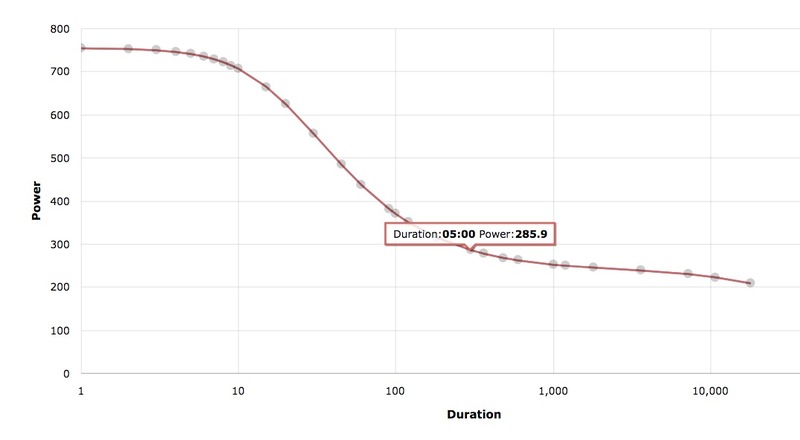 For example, if the most you can sustain for 5 minutes before having to stop is 286W, 286W would represent your 5 minute power on your power curve. This power output would be classified as a Breakaway Specialist for you, as the value 5m 00s is closest to this Athlete Type. The highest power you could sustain for 8m 43s would be classified as a GC Specialist, and so on. Sprinters tend to have higher power over shorter durations and time-trialists tend to have higher power over longer durations. Fatigue is what defines the limits of performance. In Xert, the fatigue you encounter during exercise is governed by the three systems identified by your Fitness Signature. The work you do (and thus the strain you experience) must therefore be generated by (applied to) these same three systems: low, high and peak. To understand how these three systems work together to deliver your performance, we look at their ratios (work contribution/allocation ratios ) to see how each contributes to your power output for a steady-state-effort-to-exhaustion of a given period (e.g. 6 minutes). 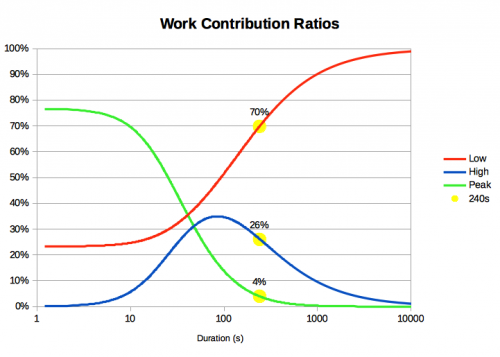 To conceptualize this, consider a workout with work intervals at 500W, and rest intervals at 0W in between. Whether the rest intervals were 10 seconds, 1 minute or even 10 minutes, you would characterize the workout to have a focus of 500W. If the rests in between were at 10W, the workout would still essentially be focused on your 500W power. However, if the rests in between increased to something like 150W, then you would conclude that the focus was partially 500W and partially 150W, i.e. some value in between. Xert calculates this for you and determines what this power value would be. This is Focus. Xert calculates this every second of your activity and adds them all together for an entire workout, activity or even a season. 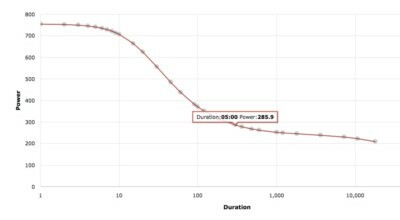 To enable Focus to be interpreted the same for everyone (similar to how %FTP is meant to be the same for everyone), the focus power value is converted to a duration based on your power curve. So when you see on Xert that an activity/workout/training period has, say, a Focus of Rouleur (6 minute power) this means that the activity/workout/training period adds up to you having performed all the strain in the same ratio as that of your 6 minute power requires. If your 6 minute power is 300W, 6:00 was your Focus Duration. You can think of this as being similar to %FTP and zones. But rather than giving you a zone and adding up how much time you spend in it, we identify how each of the three systems are in use for a given power output and add up all this strain into each of the three component systems. Comparing their ratios to those of your work allocations ratios for given power output, they translate to a Focus Duration. The shorter the focus duration, the higher the power (analogous to the higher zones). And the longer the focus duration, the lower the power (analogous to the lower zones). Xert bases training goals, classifies activities, defines workout intervals and plots your progression using this information. To further refine Focus, we also use a calculation for Specificity Rating which is a percentage. The higher the percentage the more time you spent near that Focus power. So if your Focus was 300W and your Specificity Rating was 100% (100% Pure), this would mean that all you did over the entire activity/workout would have been 300W intervals and nothing else. If your Specificity Rating was 50% (Mixed), you would have done some work over 300W and some below 300W such that the added up to a Focus of 300W. This is like the example we provided above with 500W and 150W intervals. If your Specificity Rating was a low percentage (Polar), this would mean that you had short hard efforts and long sustained efforts which amounted to the same Focus. A low percentage means you spent the majority of time below your Threshold Power. For information on how to understand the Focus Target provided by the Adaptive Training Advisor, consult the FAQ on this topic.